In a sharp competition for the attention of anglers throughout the Keys, the mangroves are up against some steep competition with the dolphin fishery and the tail end of the tarpon migration. Yes, I am known for my fishing ADD and will tend to jump around a bit in my pursuits during the course of the day. The snapper spawn gives me just one more opportunity to practice my brand of distracted fishing. Most of my clients this time of year have dolphin on their mind which is perfect timing. The opportunity to supplement the fish box with this particularly tasty fish is hard to ignore. Simply by throwing a couple of boxes of chum into the fish box we are ready to drop back onto the reef if the dolphin are being too elusive or hopefully the opposite is true and the success was hard and fast and we are hoping to fill in some of the spaces in the cooler between the large dolphin filling the box. Spawning mangrove snapper seem to be creatures of habit. If you find them on a particular section of reef one year you can bet your lunch money they will return the next. I usually look for patch reefs within about a mile of the outer edge of the reef. During the day, mangroves tend to stay low in the water column and it is often easier to find them by looking with your eyes while drifting over the shallow patch reefs with a glass bottom bucket than it is to find them with a depth finder. It definitely pays to stop on the reef on your way in or out on those particularly clear water days to scout for additional fish. Yes they will also be over the deeper sections of the reef line to depths to about one hundred feet but they are plentiful in the shallower depths and much easier to fish for. The preferred bait for the mangrove snapper is already covered under the preferred bait for dolphin. Both fresh ballyhoo and live pinfish should be on board from your dolphin excursion so no extra bait supplies will be necessary. Once you have located the snapper you simply need to anchor up current of the structure they are holding on and start a chum line flowing over the spot. The mangroves should show up in the chum within fifteen to twenty minutes. I f you don’t see any fish in the chum line by then you should move to another spot. Also if you do not see any larger fish coming up in the chum you should not worry. The big boys did not get that way by being careless. Present a variety of cut ballyhoo plugs and live, small to medium pinfish on the bottom far back in the chum line. Large plugs are important to weed out the little bait stealer size fish. You should not try to get more than two pieces of bait from a single medium ballyhoo. I prefer to use knocker rigs. A ¾ oz. egg sinker sliding immediately above a 4/0 short shank live bait hook like the venerable Mustad 9174 is the perfect rig. If you are over productive bottom you will lose a lot of rigs. The knocker rig is not only very effective in catching snapper, it is also very fast and inexpensive to replace when lost. For those of you who are more familiar with catching mangroves in Florida’s inshore waters there are a few legal differences that you should be aware of when fishing in Federal waters. First it is important to know where the Federal waters lie. They are three nautical miles from the nearest shore line. Off of the Lower Keys there are both State and Federal waters on the outer reef line. Basically if you are fishing the reef line West of American Shoal you are fishing in State waters on the outer reef line and if you are east of American Shoals you are in Federal waters. Both the bag and size limit differ in State and Federal waters. In Federal waters you are allowed ten snapper each of at least twelve inches. 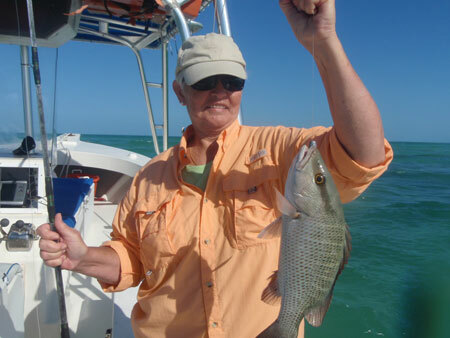 While fishing in State waters you may only possess five mangrove snapper each of at least ten inches. As the season draws nearer to the heart of the summer months the heat of the day might become a factor for some anglers. Not to worry the snapper bite is usually absolutely explosive after dark. Getting out on a reef about sunset can produce such a furious bite that you are often heading back with a limit while there is still a bright glow on the horizon. However you prefer to fish, you can maximize your catch by culling them in a live well. Fish in the medium range of about fourteen to seventeen inches are placed in the live well and are returned to the water in the order of smallest first. Fish over eighteen inches are considered big enough to not need culling and are summarily tossed on ice. You must remember to keep careful count if you intend to cull this way. If you are stopped and checked while fishing by the local law enforcement you are responsible for every fish in your possession.